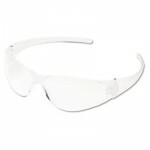 Safety glasses with curved metal frame. Clear anti-fog lenses. Soft-gel nose piece. Lightweight, polycarbonate frame and nose piece. 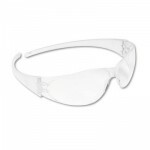 Design provides near total seal of eye orbit or maximum protection.